Anytime you’re going to invest your time, money or both into something, you want to know exactly what you’re getting. And we get that. Typically, businesses use SharePoint in-house (or on-premises) and whether it was already set up before you got there or the decision-makers just accept it as the way things are, they don’t consider another path. At Fpweb.net, we’ve been preaching the Hosted SharePoint model for a long time. As a young web hosting company, we saw an opportunity with Microsoft’s new collaboration platform to make things easier for businesses and groups and back in 1999, that meant becoming the first company to ever host SharePoint. We were excited then, but with all the changes to SharePoint and technology since then, it’s only gotten better. And in order to stay ahead in the SharePoint world, we’ve had to keep our noses to the grindstone – constantly working to make sure our hosted solutions are bringing value to our clients’ SharePoint infrastructures. At the end of the day, we have to keep one thought in mind for our business: What good is an alternative to what you’re already doing with SharePoint if it isn’t better? With that in mind, we designed our business around saving time, money and headaches for your business. We also worked hard at grooming the best in SharePoint talent so we can boldly say: The SharePoint Experts live here. Through always-available support and a fully functional SharePoint infrastructure, our SharePoint solutions are the answer for businesses that are stretching their resources to capacity while scrambling to find the time to focus on pressing business initiatives. Our managed support takes that burden off your IT’s shoulders and frees them up to innovate. In 2013, Fpweb.net decided to take it a step further and have monthly promotions that introduce our hosted SharePoint model to companies that haven’t had the opportunity to consider hosting. Each month, we develop a promotion that can make a difference for our customers. And now, in April, we found another great way to get our services in front of your business. 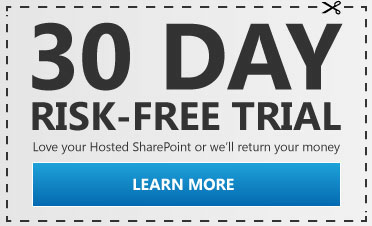 Introducing 30 Day Risk-Free SharePoint Hosting! The name says it all. Either you love hosting your SharePoint with Fpweb.net, or we return your money! For a limited time, every SharePoint contract comes with a guaranteed, risk-free trial attached. It’s available to anyone moving to a new, fully dedicated SharePoint environment and is a great opportunity to see the benefits of SharePoint hosting for your business. If you’ve ever considered hosting your SharePoint environment and taking the pressure off your business to keep up with the maintenance and upkeep of servers while trying to stay in front of your competitors at the same time, this trial is for you. If you’re ready to start with SharePoint and want to architect your solution and deploy it quickly, this trial is for you. If you’ve always wondered what the connection speed would be like in the Cloud – moving from our data centers to your environment – this trial is for you. And if you’ve ever wanted the security of knowing help is always a phone call, online chat, support ticket or tweet away, this trial is for you. We’re ready to stop telling you that hosted SharePoint makes a difference for your business, we want to show you. 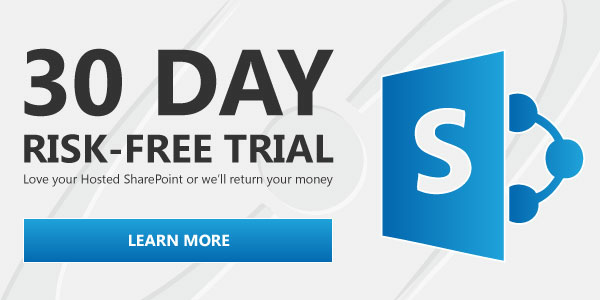 Take advantage of our 30 day risk-free trial and if you don’t see the benefits and savings for your SharePoint environment, we’ll return your money.